Unlabelled @NEWS : Actress Mercy Johnson Okojie and hubby toast each other on 6th wedding anniversary. @NEWS : Actress Mercy Johnson Okojie and hubby toast each other on 6th wedding anniversary. 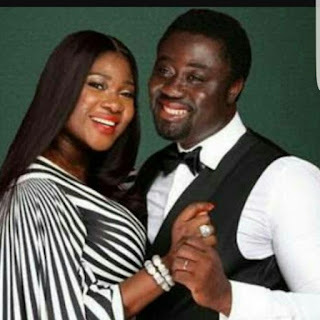 Popular Actress Mercy Johnson Okojie and hubby, Prince Okojie toast each other on 6th wedding anniversary. The actress and hubby, Prince Okojie, are celebrating their sixth wedding anniversary.The couple got married in 2012 and are blessed with four kids.Mercy Johnson took to her Instagram page to share a snap of herself and her husband, and caption it with refreshing words on marriage. “I know that Hate is not the first enemy of love, Its Fear, as it destroys the ability to Trust….But I have learnt that Love is 2 people,who trust each other enough to say the truth no matter how bitter and it stays between them.. I know, that there are 2 kinds of pain, the one that hurts you and the one that changes you…But I have learnt that in all,you are my partner not my enemy as we either win together or loose together guiding each other like a secret.. I know ,that the scars you can’t see ,are the hardest to heal….But I have learnt, that Happiness will always come to those who share their love selflessly as you can’t have love without a little pain and if the bond is strong enough to overcome the obstacle, then its worth fighting for.. And I do know, that as parents,our marriage counts more not less because even the kids are counting on us….But I have learnt ,that commitment is staying loyal to what you said you will do long after the mode you said it in has left you… Its Hard ?Yes it is But I have learnt that couples who make it,aren’t the ones who never had a reason to divorce but the ones who decided that their commitment to each other is more important than their flaws or differences……am never graduating from this school called Marriage…. Odi, I appreciate our similarities and I do Respect our flaws…..Am loyal to our love even in your Absence. Prince Okojie’s words toasting his wife , as he shared throwback photos of the two of them.